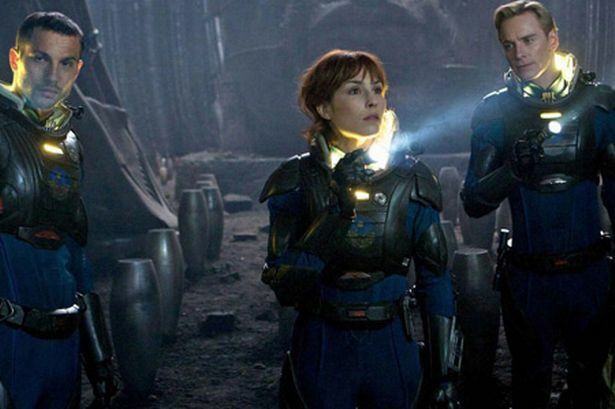 Graham Young reviews the latest cinema releases including Prometheus 3D, Red Tails, The Pact, También La Lluvia (Even The Rain) and The Innkeepers. Anyone who fancies boarding Richard Branson’s Virgin Galactic – ‘the world’s first commercial spaceline’ – should get very excited about the beginning of this movie. The flight over the remarkable scenery of Iceland is almost like an out-of-body experience, more than worth the admission alone. But that excitement, complete with water rippling like we’ve never see it before, becomes a problem for veteran British director Sir Ridley Scott. Once you’ve shown us our own planet at its very best, where do you go from there? In this instance it’s on a 2093 flight on board the space ship Prometheus towards a distant moon. Unfortunately, the craft’s interior makes whole chunks of the movie look just like any other space mission. The lighting is grey, the sets are grey, the monitors flicker and the doors slide open. We’ve been here before. Endlessly. With that in mind, we need some characters to truly believe in. But although the cast includes Noomi Rapace (The Girl With The Dragon Tattoo), Michael Fassbender (Hunger) and Charlize Theron (Monster) – good, but nothing like as effective as she currently is in Snow White And The Huntsman – they are overshadowed by the scale of the feature. And by the giant shadows of Scott’s past. As one of the great visionary directors, he has Alien (1979) and Blade Runner (1982) to his name, two of the most influential and referenced movies of the late 20th century. Once intended as a sequel to Alien, but now seen more as a relative with ‘similar DNA’, Prometheus looks and sounds fantastic down at the Giant Screen Cinema at Millennium Point (where the installation of new projector lenses last week mean the site is now comparable to its ten-year past as an IMAX cinema). But even after 33 years away from his own creation, this is not the sort of quantum leap that fellow ground-breaking director James Cameron made in the seven years between The Terminator (1984) and Terminator 2 (1991). Compared with the original Alien, Scott seems to have forgotten how to create a real sense of tension and the special creature features are more fascinating than scary. Moreover, the relationship between Elizabeth Shaw (Rapace) and fellow archaeologist Charlie Holloway (Logan Marshall-Green) is disappointingly tepid at best. Michael Fassbender’s relatively sterile android David is of more interest early on. Prometheus spends a lot of time probing the origins of mankind and wondering if, by reaching for the beginning, we might hit the end. There are interesting ideas about sexual infections, how billionaires can have a ‘god complex’ and all the rest of it in a film where the 3D is there to admirably increase depth. But, as a thrill ride, Prometheus is steady as she goes. So while fanboys will certainly enjoy the mental journey, cinema-goers looking for physical, stellar excitement might be left wishing for booster rockets. Already a 1995 HBO film called The Tuskegee Airmen – which also starred Cuba Gooding Jr – Red Tails is the 1944 story of a US air squadron based in Italy during the Second World War. Trained in Alabama, the experimental team is comprised entirely of black American ground crew and pilots at a time when the US suffered from racial segregation at all levels of society. Considering George Lucas is the executive producer of this film, the opening words on screen could have been a disastrous introduction. Remember how The Phantom Menace (1999) had enough tax notes in the prologue to send a shudder down even Gordon Brown’s spine? Here, the information is admirably short and to the point: ‘Blacks are mentally inferior, by nature subservient, and cowards in the face of danger. They are therefore unfit for combat’. Attributed to a ‘1925 US Army War College Study’, one could perhaps argue, in retrospect, that such ridiculous thoughts eventually became a form of unintentional, reverse psychology. The opening attack sequences are thrilling, even if it’s just a case of taking out one German vehicle. ‘Congrulations kid. You got yourself a truck’ says one pilot. ‘I can go back victorious,’ says the shooter. Some of the dialogue feels overly modern and clunky, just like the cockpit scenes look too studio comfortable. The ensemble nature of the piece means that neither Gooding Jr nor Terrence Howard are able to command the screen like a Denzel Washington or Forest Whitaker in their prime and CSI director Anthony Hemmingway isn’t too concerned with showing the grimier side of war on the big screen, either. But at least he and Lucas have tried to make good use of the latest ‘combat’ technology and the distilled essence of this story is surely of more long term value than what Britain’s own Tony Scott and Tom Cruise were dealing with in Top Gun (1986). It’s not giving anything away to say that the film ends with the airmen being properly saluted. And a note that ‘the highly decorated Red Tails compiled one of the best records of any air fighter group in World War II, including 96 distinguished Flying Crosses. 66 Tuskegee Airmen were killed in action’. With a screenplay by his nine-time regular screenwriter Paul Laverty, this is arguably the best film that Ken Loach has never made. It is, by some distance, the real ‘film of the week’, directed in Loach-like style by a Madrid-born actress called Icíar Bollaín whose best known movie as a director is Take My Eyes (2003). In terms of man’s relationship with a landscape of resources which have to be managed, it’s certainly an interesting cousin of Land And Freedom (1995), the still record-breaking movie at the MAC in Cannon Hill Park. This was the last movie Loach directed before he then began his remarkable partnership with Indian-born Laverty on Carla’s Song (1996). Two real life ‘gold and water’ stories 500 years apart make Even The Rain a fascinating two-for-one offering, with director Sebastian (Gael Garcia Bernal) and his producer Costa (Luis Tosar) trying to make a movie about the conquest of Latin America by Christopher Columbus. Meanwhile, leading actor Carlos Aduviri is not only wonderful as a 15th century native in front of the cameras, he’s also a deeply passionate, film-threatening presence as a man campaigning against the privatisation of water at the turn of this century. The study of the importance of resources is admirable, the performances are terrific and the mixture of Bolivia’s vast landscapes and teaming city streets all treats for the eyes. Showing only at the Warwick Arts Centre from Monday to Wednesday, Even the Rain is pure cinema, complete with some fruity subtitles in English. This paranormal horror film is showing at the venerable Electric Cinema on Station Street as part of its cleverly-titled Shock & Gore strand. I rather suspect in this instance that the cinema’s theme – if not the film title itself – will lead the uninitiated to expect a bit more in the way of blood and guts. Naturally, if you don’t like the sight of blood on screen stay well clear, but, for the most part, this is an atmospheric, ghost-hunting piece with a greater emphasis on old fashioned chills. Written, edited and directed by Ti West (The House of the Devil), the action is set in the creaking Yankee Pedlar’s Inn. For a place that is supposed to be crumbling and haunted by spooks, the mistletoe colour of the decor is remarkably soothing. Yet the hotel is on its last legs and due to close and the final guests appear to be potentially vulnerable and fewer in number than an Olympic rowing team.It’s a decent set-up, with the remaining employees include Luke (Pat Healy) – a Morgan Spurlock lookalike with a Tintin-style hair motif on top of his head – and Claire (Sarah Paxton) wondering about the hotel’s ghostly reputation. Neither star is a big name, so the casting feels fresh. Staying as a guest called Leanne, you wouldn’t necessarily recognise the now 54-year-old star as having once been the hot stuff from Top Gun (1986) and, for this reason alone, West ought to be congratulated for giving a quality actress of a certain age a decent amount of screen time. After the opening credits feature a deliciously-skewed, multi-layered score from Jeff Grace, West then opens the film with Chapter One – the Long Weekend. Oh, no! This is a supremely irritating film-making device, because you are instantly wondering how many chapters will there be. How long will each last? Will it make the film feel as insufferable as Nicole Kidman’s Dogville (2003) which had nine of the things. While The Innkeepers never quite chills the bones below the temperature of the salad compartment, you can rest easy... at least this is one hotel that isn’t a Hostel. Written and directed by little-known Nicholas McCarthy, this unoriginally-titled release should not be confused with the Jodi Picoult novel of 1998. Instead, it’s the story of two sisters Nicole (Agnes Bruckner) and Annie (Caity Lotz) who have recently lost their mother. Strange things are happening in their childhood home where they need to pay their last respects and it turns out there are really bad reasons why things are going bump in the night. A contrived cross between Silence of the Lambs and Paranormal Activity, McCarthy uses silence to try to hold people’s attention... until you realise that for long periods nothing is actually happening. Despite having an effective but shockingly-predictable computer-chat scene, The Pact didn’t raise a single hair on the back of my neck.